The Striders have topped pool E after winning all their pool matches in the McDonalds Coral Coast 7s Women’s Competition. 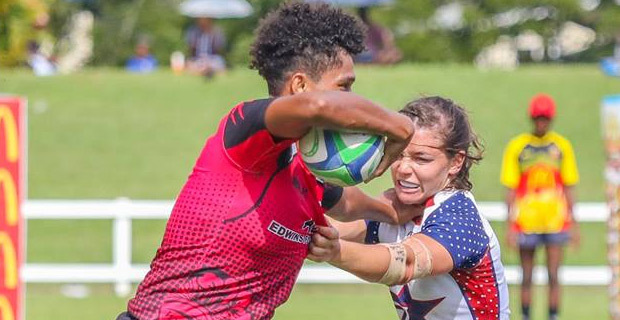 Striders defeated Fiji Airports Nadi Blazers 24‑0 in their opening match, thrashed Marist Seahawks 26‑0 and went on to beat Stars USA Women 29-5 in their last game. Scion Woo defeated Hong Kong Women 12-10 in their last pool match and topped pool F.
The final two games in pool G are underway with Fijiana Development taking on Marist Seahawks 1 and Outrigger Knight facing Lautoka Crusaders. In other matches, Marist Seahawks 1 thrashed Lautoka Crusaders 36-5, Fiji Development 7s defeated Outrigger 40-0, Sion Woo thumped Fiji Airports Nadi Aviators 44-0. The Women’s quarterfinals will be held tomorrow while the Men’s Tournament will begin tomorrow. You can catch the live commentaries of the quarter finals from 11.20am, semifinals from 2.50pm and final from 5pm Saturday on our sister station Viti FM 92.2FM, 92FM and 92.6FM.